Aamir Yaqub visited Abbey Road Institute London last Friday to guest lecture for our students about mixing, the music biz, and top tips on how to make it as an engineer. 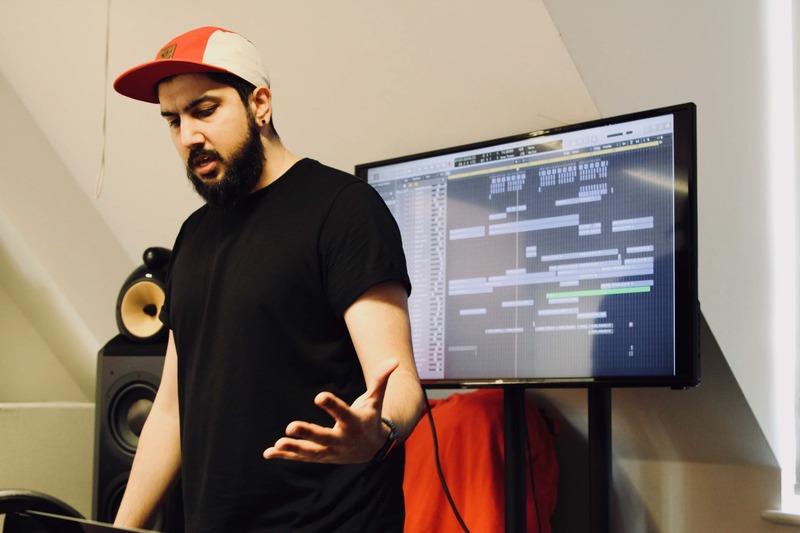 After studying at Leeds College of Music, he headed to Metropolis Studios. It was at Metropolis that he became the go-to engineer on sessions with Interscope Records. Producer and engineer Aamir spoke to our students about how unexpectedly careers can change overnight. After working hard at Metropolis, Aamir was told he would be booked for a two-month session with none other than Rihanna. The resulting recordings earned him a Grammy. Aamir was in such disbelief he rang up the Grammy office where he got his confirmation. Following this success, he would go on to engineer sessions with David Guetta, Will.I.Am, Sia, and Ne-yo. Aamir began as an overnight receptionist at Metropolis, working 6pm-8am. ‘Plenty of coffee was needed throughout shifts. While the hours were odd it meant there were a lot of American clients coming in then so I got to meet a lot of people.’ Aamir explained to the students how opportunities like this can lead to your next job, ‘work begets more work’ he told the students. To begin with, Aamir broke down a Logic Pro X session that was a little different than his usual mixes. It was a mix done on a tight deadline to fix another mix engineers mistakes. Aamir showed us how he quickly addresses problems with sessions such as excessive filtering and a muddy low range. Within a few hours, he was able to get the track sounding great and it led to the artist getting a record deal. The Q&A is always a great time for our students to pick the brain of a talented engineer. The students asked everything from how to work as a freelancer to getting music heard in a crowded digital landscape. ‘I got a great experience at a bigger studio. Now that I’m freelance I have a bit more say in the projects I take on.’ He finds himself producing more and bringing on artists at an earlier stage in their careers. When asked about advice for young mix engineers on a budget Aamir explained that ‘some of my favourite plugins are free. Polyverse Music Wider is a really great plugin’. The masterclass was a truly invaluable experience for the students.